1. Bring a large pan of water to the boil. Crack an egg into a cup, then gently tip into the boiling water. Repeat for all 4 eggs. Remove the pan from heat and set it aside for 4-5 minutes until the eggs are softly set. 2. Meanwhile, place the washed spinach in a large saucepan. Cover with a lid and cook gently for 2 minutes until wilted. Drain and squeeze out any excess liquid. 3. Put the cooked spinach into a bowl and mix in the crème fraîche and mustard. 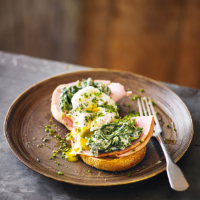 Place a slice of ham on each toasted muffin half and top with the spinach mixture. 4. Top each with a poached egg. Sprinkle over the chives, season with black pepper and serve swiftly. Cook's tipFor a twist on the Florentine, this would work equally well with scrambled eggs, or use a slice of smoked salmon instead of the ham. This recipe was first published in Fri Aug 29 10:41:00 BST 2014.